Home / Driver of the Year / Jason Johnson / Press Release / Ro Cowan / Sprint Car Hall of Fame / World of Outlaws / Jason Johnson named North American 360 Sprint Car "2012 Driver of The Year" for fourth time in career. 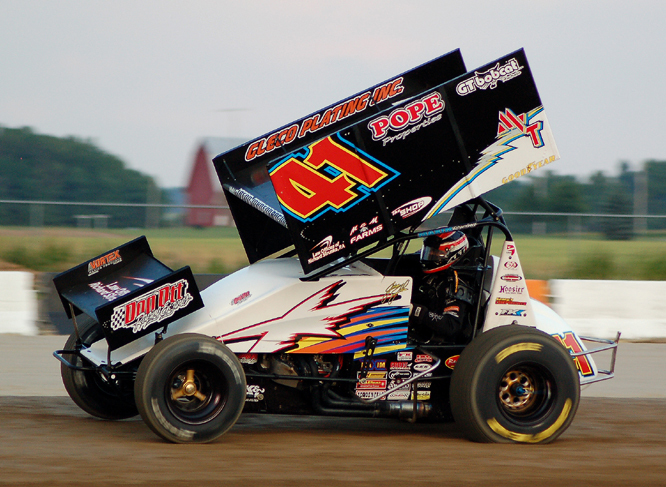 Jason Johnson named North American 360 Sprint Car "2012 Driver of The Year" for fourth time in career. KNOXVILLE, IOWA (January 10, 2013) - Jason Johnson of Eunice, Louisiana, was voted the 2012 “Driver of the Year” by the North American 360 Sprint Car Poll voting panel of media members, promoters, sanctioning officials and manufacturers for the fourth time. Stewart, the American Sprint Car Series (ASCS) national tour champion, earned thirteen (13) of the sixteen (16) first-place ballots cast in the year-end poll. Jason & Bobbi Johnson earned their second “Team of the Year” award as well. Those drivers ranked second through fifth, respectively, are Wayne Johnson of Oklahoma, two-time “Driver of the Year” Shane Stewart of Oklahoma, Brady Bacon of Oklahoma, and United Sprint Car Series (USCS) champion and 2002 “Driver of the Year” Tim Crawley of Arkansas. Rounding out the ‘top ten’ for the season are California Sprint Car Civil War Series champion Andy Forsberg, Central Pennsylvania 358 Point Series champion Pat Cannon, Empire Super Sprints (ESS) champion Chuck Hebing, Tony Bruce, Jr., and Johnny Herrera. In addition to Jason Johnson, others receiving first-place votes were Tim Crawley (one), Andy Forsberg (one) and United Racing Company (URC) champion Robbie Stillwagon (one). Short Track Nationals runner-up Christopher Bell of Oklahoma earned the North American 360 Sprint Car Poll “Rookie of the Year” title in his first full season of winged 360-cubic-inch sprint car competition. Chris Moss of Roush-Yates Engines earned the “Builder/Manufacturer of the Year” honors for 2012. In addition, Allan Holland of www.hoseheads.com will receive the “Media Member of the Year” award for the sixth time, although he has also won the ‘410’ poll honor twice. Tracey Clay of the I-30 Speedway in Arkansas earned her third “Promoter of the Year” award, while Kyle Larson of California will receive the “Wild Card Award” for his exciting ‘360’ sprint car performances in 2012. Interestingly enough, Larson won the same award this year from the North American 410 Sprint Car Poll voting panel and claimed all three of the same awards in 2011 (‘410’, ‘360’ and Non-Winged). The North American 360 Sprint Car Poll is an annual awards program of the National Sprint Car Hall of Fame & Museum Foundation, Inc., of Knoxville, Iowa. All awards will be distributed in the spring of 2013 at tracks throughout North America. The awards were announced on the third day of the Lucas Oil Chili Bowl Midget Nationals in Tulsa, Oklahoma. Also receiving multiple votes: Christopher Bell, Seth Bergman, Shane Golobic, Derek Hagar, Scott Kreutter, Brad Loyet, Tony Stewart and Billy Wallace.